As focus rightly remains on mitigating environmental and economic destruction in the wake of the Deepwater Horizon tragedy, the next challenge is how, or if, continued expansion of offshore drilling should proceed. Particularly in deep water drilling projects like BP’s failed well in the Gulf of Mexico. The first step then is how long and extensive the current moratorium on offshore drilling will be. Earlier this year, president Obama lifted the long-standing moratorium on offshore drilling, only to halt further offshore projects pending an investigation into the Deepwater Horizon tragedy. I spoke with Tom Whipple, a prominent peak oil and energy analyst, about these issues and what it may portend for the future. 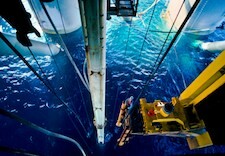 As tragic as the Deepwater Horizon incident is, it may be just a beginning as land-based oil fields continue to decline. By the end of the decade, many oil companies and analysts expect as much as 40 percent of their global production to come from deepwater offshore drilling. Despite what Rush Limbaugh says, the reason oil companies are pushing further out into deep water is because that is where the oil is. Concern over the halting of expected expansion of offshore drilling has prompted the senators from Louisiana, Alabama, Mississippi, Texas, and Alaska to send a letter to Interior Secretary Ken Salazar and president Obama requesting the halt in offshore production be lifted for shallow water projects. The letter expressed concern over an estimated $135 million is lost revenue and the loss of 5000 Gulf coast jobs lost if some 57 wells are not allowed to continue within the next six weeks. In total, Whipple says that a total of $3 billion in offshore projects are currently on hold, so pressure to get some offshore projects back into production becomes a more pressing issue with each passing day, even as the environmental impacts worsen from the as-yet-uncapped well spilling thousands of barrels, probably tens of thousands, of oil into the Gulf every day. Whipple referred to reports from survivors of the explosion that safety procedures had been compromised on the Deepwater Horizon in an effort to expedite the project that was weeks behind schedule and costing BP $1 million a day. The pressure on BP managers on the rig to get moving led to friction between Transocean, owner and operator of the Deepwater Horizon rig, and BP, owner of the well. Combine that scenario, with the party-like, regulator-in-name-only approach from the Minerals Management Service (MMS), the regulatory agency charged with permitting, oversight, and regulation of offshore drilling, has led to fears within the oil industry that the resulting backlash will create an atmosphere of “micro-management”, according to Whipple. The kind of micro-management the puts a “safety guy” from the government on board every rig, able to veto any decisions made by well owners and rig operators. “And they don’t want that,” says Whipple. Oil companies and proponents have assumed the expected return from deepwater drilling (up to 40 percent of global production as stated earlier) was worth the risk, but results from some operations have begun to cast doubt on that assumption. BP’s Thunderhorse platform, described by Whipple as the “poster child” for deepwater oil production, began operation in 2008 with an expected production of 1 billion barrels at a rate of 250,000 barrels per day. The project started off well enough. By January of 2009, production peaked at 172,000 barrels per day, but then rapidly declined to 61,000 bpd by last December. Since then, BP has refused to say what is happening at Thunderhorse. One presumes it isn’t going as expected. As dramatic and tragic as the disastrous oil rig explosion and spill in the Gulf is, it represents only the beginning in a growing tide of events indicating that the days of cheap and easy oil are now over. For Whipple, he sees several factors, including an exponential rise in demand from both China and exporting nations, as an urgent warming that we must take seriously the threat of a severely disrupted oil supply. Before the decade is out, Whipple and other analysts believe the supply of oil available in the U.S. will be cut in half, well beyond what any policy of domestic “drill baby drill” could hope to replace. Take a good look. This is what peak oil looks like.